1. The shield has a green boarder with five sides. This shield symbolizes the spirit and soul of the Jambi people who fully embrace Pancasila (5 principles). Belief in the one and only God. Democracy guided by the inner wisdom in the unanimity arising out of deliberations amongst representatives. Social justice for all of the people of Indonesia. 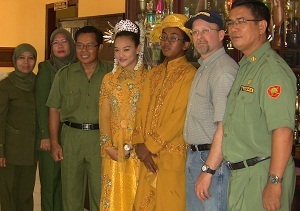 C., with some of the staff at SMK N 2. On Monday, October 29th we had the honor of visiting State Vocational High School No. 2 (SMK N 2–Sekolah Menengah Kejuruan Negeri 2) and observed their remembrance/ celebration of Sumpah Pemuda (National Youth Pledge Day). This remembrance is held on the 28th of October each year (this year it was held on the 29th since the 28th was a Sunday). One of the performers of an impressive dramatic presentation. At the school all students and staff were assembled in front of the school. The principle gave a formal address, prayers were made, a few songs were sung, a marching band performed, and then a very dramatic performance was put on by about 15 students. The drama was their effort to ingrain in all assembled, the values of integrity, unity, and oneness as a nation. The performance was in the form of a drama that lasted no less than 30 minutes. It was quite powerful and impressionable! To Which Province Does this Island Belong? 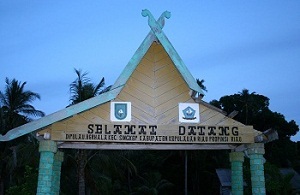 Upon arrival at Pulau Berhala, after walking down the boardwalk, you will pass under the above sign that says: “WELCOME, to PULAU BERHALA, in the SINGKEP regency, of the KEPULAUAN RIAU province. Upon arrival at Pulau Berhala you will walk down a boardwalk, then pass under a portal that reads: “WELCOME, to PULAU BERHALA, in the SINGKEP regency, of the Kepulauan Riau Province (KEPRI). Just 100 feet further is a smaller blue monument, erected by the Jambi Province, which they installed to make their claim to the island. The small blue Jambi monument is no longer legible. We were told that the governor of the Kepulauan Riau Province had the Jambi monument defaced. 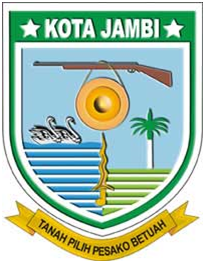 The below information explains the seal, crest, or coat-of arms, of the City of Jambi. On the 1st of September, which was the end of Ramadan, and one of the most celebrated days of the year for Muslims (Eid ul-Firtr), there was a massive fire in the City of Jambi that destroyed 169 homes. The cause of the fire is unknown. What led to the massive spread of fire was windy conditions, poor access for emergency vehicles, as well as many observers blocking lanes, preventing rescue equipment from gaining access. The lack of an enforced fire code was also a contributing factor. The location of the fire was just to the north of the Sangkawang Cemetry and south of the Batanghari River. One of the girls on the “Raising the Flag” team (Paskibraka). Today we went to an Independence Day celebration in a village about 45 min. north of the City of Jambi. 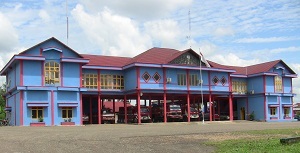 The name of the village is Jambi Kecil. The exact location of the celebration was at the office of the Camat. The celebration involved a very ceremonial raising of the Indonesian flag, and a prayer. There were no long speeches. It was a very interesting and informative event, watching how Indonesians commemorated their 66 years of independence.